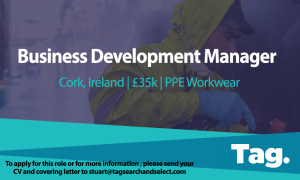 Cork Ireland , €35,000 + Bonus (€45,000 OTE), PPE Workwear. Manage our existing distribution portfolio within your allocated geography. Develop initiatives and programs to increase our spend share within these distributors. Create demand for the companies’ extensive range of safety clothing at targeted end users, whilst back selling through our distribution network. Drive demand for our product range by working with end users both independently and with distributors to achieve profitable sales growth. Set annual objectives with selected distributors to increase share of spend. Input and maintain high-quality reporting into our Microsoft Dynamics CRM system. Attend exhibitions and open days. Play a key part in ensuring a high level of customer satisfaction. Identify opportunities for new product development and new markets. A clear communicator with a track record of working independently and as part of a team. A proven results-driven sales person.